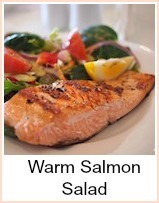 Salmon recipes for celebration meals. Many people find that increasingly, their guests are adopting a more restricted eating plan. I know I have friends who range from having given up red meat to being completely vegan. It can be pretty hard on a host to try and accommodate everyone and not feel like they're running a cafe or working as a short order chef! 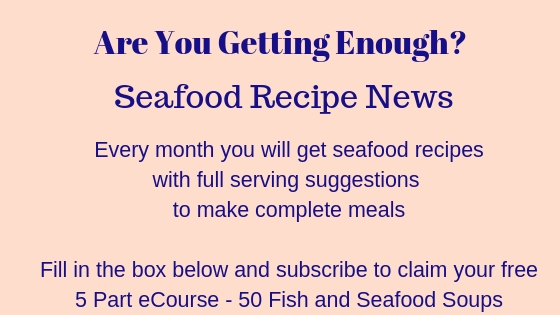 I can help you with the fish recipe dilemma :-) Avoid getting bogged down with cooking different meals for everybody - here's a painless Pescatarian solution. you can buy and cook it in small portions - just one or two at a time. you can buy it at the grocers from the fresh fish counter, you don't have to go out of your way. 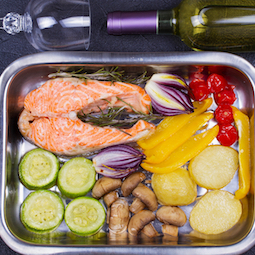 you can serve the same veggies for everybody as a rule and substitute a serving of what is often called the 'King of Fish' for the turkey or other meat everyone else is eating. it's a substantial textured fish. it's a lovely colour, it won't make their plate look 'anaemic' - the lovely salmon pink will blend in and make for a good looking plate. In fact, your turkey will have less colour! These recipes are all suitable for cooking one or two portions with the least possible effort. A 6 ounce portion is adequate for one serving. That's 160 grams metric. They won't want gravy but might like the stuffing, bread sauce and veggies. Make some herb butter to put on their fish which will melt and become a sauce. 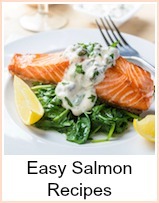 Easy Salmon Recipes are those that cook very quickly - this one cooks in about four minutes a side in an oiled frying pan. The sauce tartare is basically creme fraiche mixed with some chopped capers and a squeeze of lemon which you can use or not as you feel. So, as you can see, this would be perfect to cook just before everybody's ready to sit down and your Pescatarian guest would get hot salmon! 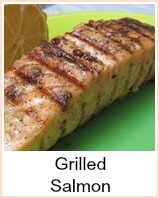 You can use cutlets, steaks or fillets. 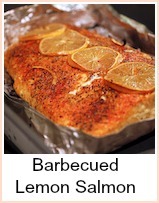 Honey Mustard Roast Salmon - really easy to do. You can prepare the glaze well in advance and then bake for around 15 to 20 minutes. 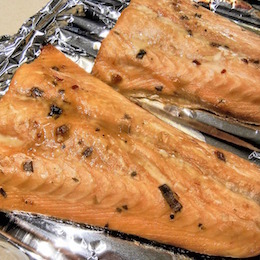 A superb Broiled (Grilled) Salmon - ready in about ten minutes. 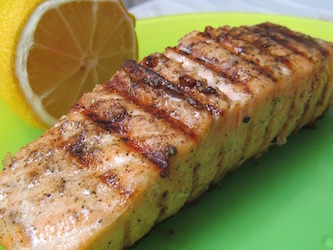 Make up the lime marinade beforehand and leave the salmon for around thirty minutes. Then under the broiler for five minutes, turn and five more minutes. Serve with your regular sides and maybe a pat of herb butter again. 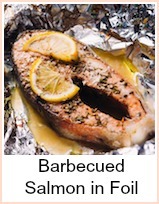 This marinade for a barbecued salmon would be marvellous for cooking in foil in the oven. 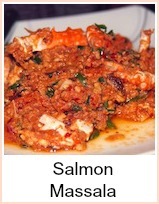 The good thing about salmon recipes is that they cook quite quickly. You don't need to put yourself out a great deal to cook a piece of salmon for one or two people. 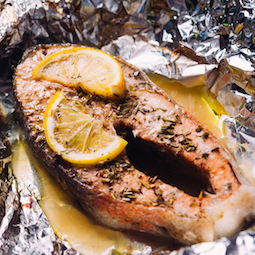 As a general rule of thumb, a piece of fish needs 10 minutes direct cooking per inch thickness. A bit longer for oven baking. You can get all your sides ready, have your fish cooking ingredients prepared and it'll be done in a few minutes. Serve onto a warmed plate and let your Pescatarian guest help themselves to sides along with the others. 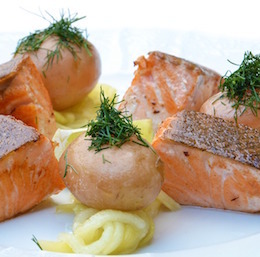 There is a simple method for poaching salmon which you can do in advance. That will mean the fish is served cold on the plate, but if you have hot sides, then nobody will mind cold poached salmon - it's a delicacy! 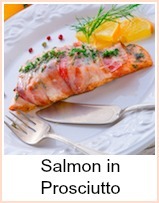 I'm sure you've seen the elaborate whole salmon served cold as a centrepiece of a buffet. Cold poached salmon is not a 'cop-out'. 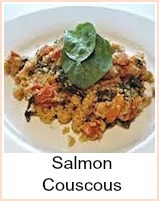 Now, if you want to keep it entirely separate and you have the oven space, then this one dish salmon will be great. 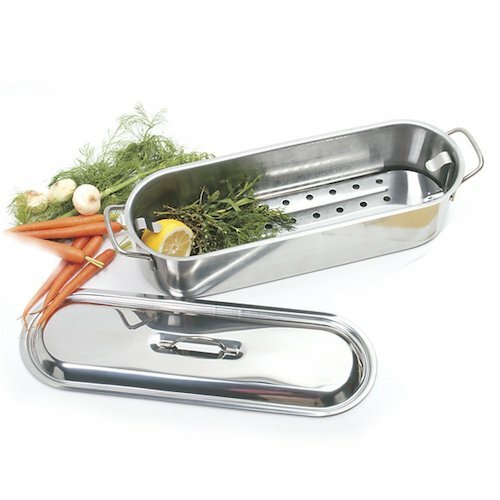 You can cook enough for two people in one small roasting tin. 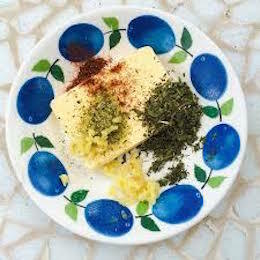 Make some herb butter in advance to pop on to melt over and make a sauce. This can be done and kept in the fridge. It's a perfectly good meal to give a Pescatarian instead of your Thanksgiving or Christmas turkey - it takes a small amount of preparation and only twenty five minutes cooking time. The potatoes will need bit of pre-cooking. Everything else will cook just beautifully alongside the salmon, so you might like to consider that when you're cooking potatoes for your turkey dinner. 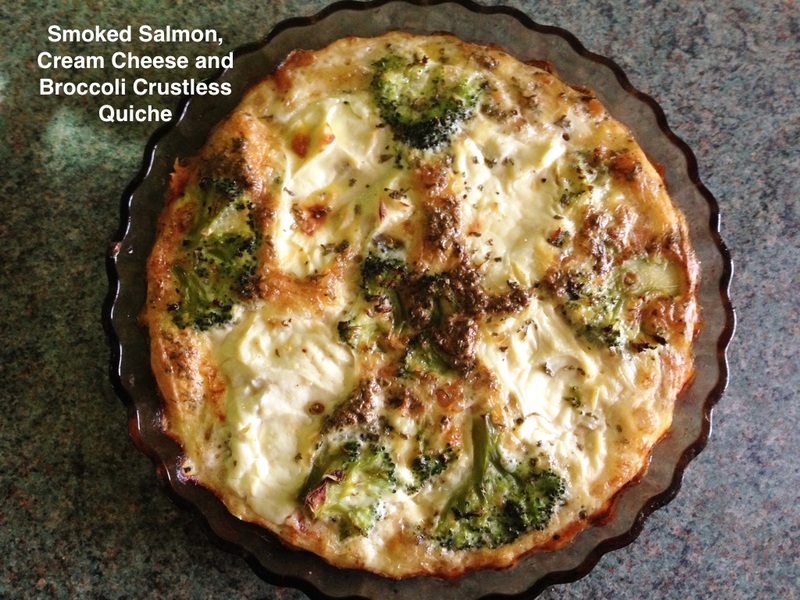 You could also serve a gorgeous salmon quiche - you can use hot or cold smoked salmon, canned or fresh. The choice is yours. 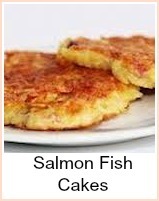 This is a good option if you have more than one Pescatarian to cater for. Now, of course you could decide that salmon is going to be the main event for the whole gathering, in which case, what could be better than a whole poached salmon. This link will open in a new window. 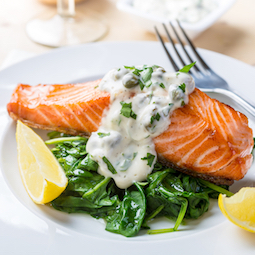 You could follow the 'easiest' method of poaching salmon recipes which is here. You would portion the fish if you don't have a fish kettle and cook it in separate parcels, then reassemble on the plate. 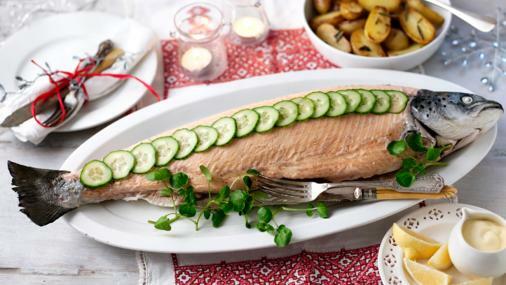 Cover the whole fish with cucumber slices to look like fish scales and you would hide the joins. If you want to invest in a Fish Poacher or Fish Kettle as they are sometimes called, then Amazon have a great selection. They range from tens of dollars to hundreds of course. This one here is great. It has a sturdy handles and a perforated rack for the fish to sit on. It is the 'top pick' and has many 5 star reviews. Click on the photo to go through to Amazon. I love Amazon, you can rely on them for a great choice and ease of buying with a great returns policy. A recipe for salmon salad. 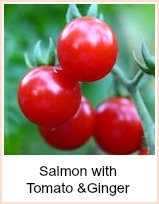 You can use fresh or canned salmon. There's a simple tip for making salad dressing which a lot of people make a fuss about. It's really easy if you follow my method. Salmon with pasta using fresh or canned with avocado pears. A tasty pasta salad which is heart healthy. 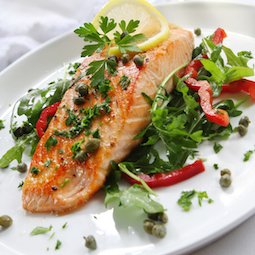 Salmon is also an invaluable source of Omega 3s, 6s and 9s. The whole family will benefit from a regular intake of these.